We have designed and created a unique series of short courses designed to meet specific the training and education needs of modern EAs and PAs. Featuring one-day and two-day courses, these training courses are exclusive to Executive Assistant Academy. To find out more about our courses, please click on the relevant course name link below. All of the sessions are held at Karstens in each respective capital city CBD from 9am to 5pm. Our flagship course delivered over one day, utilising processes of self-discovery and industry benchmarking to elevate the effectiveness of the EA and the Executive, to optimise the performance of the Executive office and to ensure that the Partnership operates at its highest level. 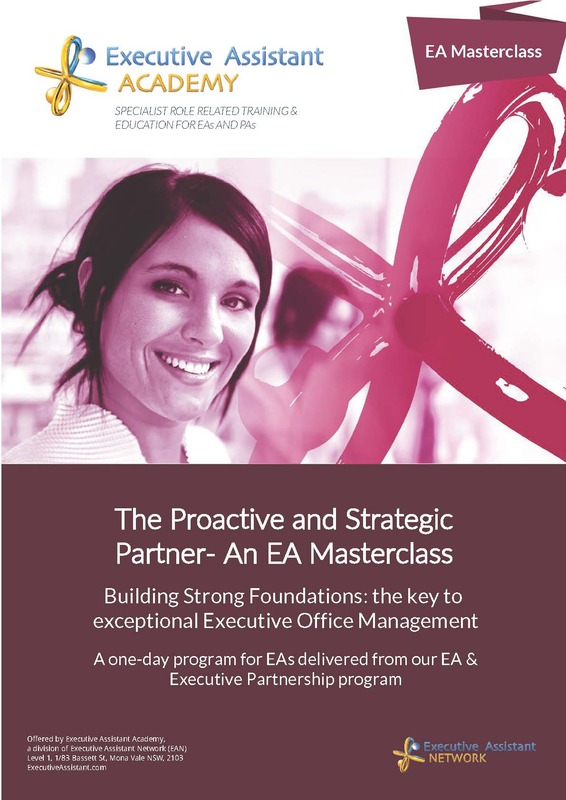 The program is designed to enable Partnerships to be benchmarked against leading industry standards developed over a decade from research with EAs and their Executives by the Executive Assistant Academy, and to enable EAs and their Executives to discover best practices and approaches for their own unique Partnership circumstances. One of our most frequently booked courses. No matter how much the role of EAs and PAs evolves, these skills never go out of fashion or demand. If anything, as your role evolves and you interact with other more senior colleagues, or are involved in greater number of projects and meetings, they will become even more important. According to our most recent member survey, about 95% of Executive Assistants and Personal Assistants are involved with organising events / functions, parties, conferences or other meetings. Many find this extremely stressful. This course gives EAs and PAs sufficient knowledge and skills to take the stress and risk out of any event and make sure they are always outstanding. From the dawn of personal secretaries and through to Personal Assistants and Executive Assistants, what sets you apart was your organisational and time management skills. But as your role expands and as you are required to make more judgement calls around competing priorities, ensuring your skills are up to the task is vital. This course will show you how. As your role evolves and you accept more responsibility for minor and major projects, and as you become more involved in assisting your executive with every aspect of their planning and then the execution of their strategies, having a fundamental understanding of both is essential. We have combined elements of both disciplines into one a day course to get you stated on what you genuinely need to know. Your role is to help increase the efficiency and effectiveness of your executive. To do that you need to understand what their objectives are, what their risks are and what they are measuring and tracking along the way. That means you must have at least a basic to intermediate knowledge of the key aspects of corporate finance. In business writing, the language is concrete, the point of view is clear, and the points are well expressed. Good writing is hard work, and even the best writers get discouraged. However, with practice you can feel more confident about your own writing. This one-day workshop will give you the tools to become a better writer. A great presenter has two notable qualities: appropriate skills and personal confidence. Confidence comes from knowing what you want to say and being comfortable with your communication skills. This material is also suitable for those who are relatively new speakers who want some encouragement to speak up in meetings or who want some training before they begin making presentations on behalf of the organisation. This course is aimed at improving your skills and learning some new techniques which will give you the persuasive edge when you are making a presentation, fielding difficult questions, or presenting complex information. Emotional intelligence, also called EQ, is the ability to be aware of and to manage emotions and relationships. It’s a pivotal factor in personal and professional success. IQ will get you in the door, but it is your EQ, your ability to connect with others and manage the emotions of yourself and others, that will determine how successful you are in life. This one-day workshop will help you develop your emotional intelligence.